The Slippery Slope of What Defines "Due Process"
In my opinion, when any Attorney tells a client or convinces a person to give up on going through a 3020-a arbitration because he/she "will be terminated" or "lose his/her pension", as we hear so often from NYSUT and even some private attorneys, the due process rights of that individual is being denied to him/her. How does an Attorney/advocate/representative know that the person charged will be terminated? Before that final judgment there is always mediation, settlement, negotiation. I believe that most attorneys do not want to go through a 3020-a because it is time consuming, and a drain on time and money. Certainly, it is a lot easier to "convince" someone to give up, than to fight. While I and the private attorneys that I work with do not go for the argument that someone will be terminated, there are never any guarantees. But we are willing to settle for a withdrawal of charges if the teacher wants to not pursue a full hearing. We have saved the jobs of more than 40 teachers who have hired us to represent them. But to demand that a person give up his/her right to argue against false charges that will forever damage his/her reputation and future earnings? No thank you. Due process is the legal requirement that the state must respect all of the legal rights that are owed to a person. Henry J. Friendly wrote about a fair hearing in his excellent essay, Some Kind of Hearing. Yet this is not what the DOE wants to provide at a 3020-a, and that is why you win in your defense. You must add the context and motive to the charges because the DOE will not do that. For example, the DOE attorney may obtain testimony that on X day you, a teacher, did not hand in a lesson plan, and suddenly you are charged with incompetency, conduct unbecoming a teacher, etc. There is not other evidence given. But let's say you were in the hospital, or the day you were supposed to hand in the lesson plan, you were absent? or, you did hand it in, and they want to say you didn't? Your defense and proof are what matters. It seems to me that the DOE always presents the same case, no matter what the specifications, so the defense of innocence and giving testimony on motive/context becomes the key to winning. Of course, it also seems to me that ADVOCATZ is the only entity which cares about the process that is "due". The Constitution states only one command twice. The Fifth Amendment says to the federal government that no one shall be "deprived of life, liberty or property without due process of law." The Fourteenth Amendment, ratified in 1868, uses the same eleven words, called the Due Process Clause, to describe a legal obligation of all states. These words have as their central promise an assurance that all levels of American government must operate within the law ("legality") and provide fair procedures. Most of this essay concerns that promise. We should briefly note, however, three other uses these words have had in American constitutional law. The Fifth Amendment's reference to “due process” is only one of many promises of protection the Bill of Rights gives citizens against the federal government. Originally these promises had no application at all against the states. Did the Fourteenth Amend­ment change that? In the middle of the Twentieth Century, about a century after its adoption, a series of Supreme Court decisions found that the Due Process Clause "incorporated" most of the important elements of the Bill of Rights and made them applicable to the states. These decisions almost obliterated any difference between the Bill of Rights and the Fourteenth Amendment. If a Bill of Rights guarantee is "incorporated" in the "due process" requirement of the Fourteenth Amendment, state and federal obligations are exactly the same. The right to a jury trial, to take just one example, means the same in state and federal courts; there are no differences about the number of jurors required, whether they have to be unanimous in their verdicts, and so forth. If the courts stretched Fourteenth Amendment “due process” to apply the Bill of Rights to the states, they stretched Fifth Amendment “due process” to require the federal government to afford equal protection of the laws. The Equal Protection Clause of the Fourteenth Amendment forbids the states from establishing segregated schools or otherwise discriminating invidiously against some of their citizens. There is no equal protection clause in the Bill of Rights. In a case involving segregation in the schools ofWashington, D.C., which as the nation's capital is a federal enclave governed by federal law, the Supreme Court found that the Due Process Clause operates against the federal government just as the Equal Protection Clause does against the states. The words “due process” suggest a concern with procedure, and that is how the Due Process Clause is usually understood. We have just seen, however, that the clause has been taken as a kind of proxy for other rights. In those cases, the rights were actually expressed somewhere in the Constitution, but only as rights against federal (or state) action. What about rights the Constitution does not mention — “unnamed rights,” as Charles Black calls them, like the right to work in an ordinary kind of job, or to marry, or to raise one's children as a parent? The dominant constitutional controversy of the first third of this century, which still echoes in the arguments about abortion and other “privacy” issues like sexual preference, was about an idea called “substantive due process.” The question was whether "due process of law" might put substantive limits on what legislatures could enact, as well as require procedures of judges and administrators. Thus, in 1905, the Supreme Court found unconstitutional a New York law regulating the working hours of bakers, because it thought the public benefit of the law did not justify depriving the bakers of their right to work under whatever terms they liked. For thirty years, conservative judges sometimes used this idea to find legislative judgments about social or economic programs invalid, retarding the emergence of social welfare legislation. In the late 1930's, after years of sharp criticism, the substantive due process approach was repudiated for "economic regulation." Many think the idea is still vital as a barrier to legislation curbing other individual liberties. While the text of the due process clause is extremely general, the fact that it appears twice makes clear that it states a central proposition. Historically, the clause reflects the Magna Carta of Great Britain, King John's thirteenth century promise to his noblemen that he would act only in accordance with law (“legality”) and that all would receive the ordinary processes (procedures) of law. It also echoes that country's Seventeenth Century struggles for political and legal regularity, and the American colonies' strong insistence during the pre-Revolutionary period on observance of regular legal order. The requirement that government function in accordance with law is, in itself, ample basis for understanding the stress given these words. A commitment to legality is at the heart of all advanced legal systems, and the Due Process Clause often thought to embody that commitment. How can we know whether process is due (what counts as a “deprivation” of “life, liberty or property”), when it is due, and what procedures have to be followed (what process is “due” in those cases)? If "due process" refers chiefly to procedural subjects, it says very little about these questions. Courts unwilling just to accept legislative judgments have to find answers somewhere else. The Supreme Court's struggles over how to find these answers echo its interpretational controversies over the years, and reflect the changes in the general nature of the relationship between citizens and government. In the Nineteenth Century government was relatively simple, and its actions relatively limited. Most of the time it sought to deprive its citizens of life, liberty or property it did so through criminal law, for which the Bill of Rights explicitly stated quite a few procedures that had to be followed (like the right to a jury trial) — rights that were well understood by lawyers and courts operating in the long traditions of English common law. Occasionally it might act in other ways, for example in assessing taxes. In two decisions at the very beginning of the Twentieth Century the Supreme Court held that only politics (the citizen's “power, immediate or remote, over those who make the rule”) controlled the state's action setting the level of taxes, but if the dispute was about a taxpayer's individual liability, not a general question, the taxpayer had a right to some kind of a hearing (“the right to support his allegations by arguments however brief and, if need be, by proof however informal”). This left the state a lot of room to say what procedures it would provide, but did not permit it to deny them altogether. Another early case suggested flexibility about the timing and nature of a required hearing. When a health inspector decided some chickens in cold storage had rotted, he didn't have to hold a hearing before he could seize and destroy them, so they could not be sold; but the owner of the chickens could sue the inspector afterwards, and if it convinced the jury that the chickens were not rotten, make the inspector repay their value. The cases just mentioned established one important distinction: the Constitution does not require “due process” for establishing laws; the provision applies when the state acts against individuals “in each case upon individual grounds” — when some characteristic unique to the citizen is involved. Of course there may be a lot of citizens affected; the issue is whether assessing the effect depends “in each case upon individual grounds.” Thus, the due process clause doesn't govern how Ohio sets the rules for student discipline in its high schools; but it does govern how Ohio applies those rules to individual students who are thought to have violated them — even if in some cases (say, cheating on a state-wide examination) a large number of students were allegedly involved. Even when an individual is unmistakably acted against on individual grounds, there can be a question whether the state has “deprive[d]” her of “life, liberty or property.” The first thing to notice here is that there must be state action. The Due Process Clause doesn't apply to a private school taking discipline against one of its students (although that school will probably want to follow similar principles). Whether state action against an individual was a deprivation of life, liberty or property was initially resolved by a distinction between “rights” and “privileges.” Process was due if rights were involved, but the state could act as it pleased in relation to privileges. But as modern society developed, it became harder to tell the two apart. Was a driver's license a “right” or a “privilege”? How about a government job? Enrolment on welfare? An initial reaction to the increasing dependence of citizens on their government was to look at the seriousness of the impact of government action on an individual, without asking, as such, about the nature of the relationship affected. Process was due before the government could take an action that affected a citizen in a grave way. In the early 1970's, however, this gave way to an analysis that accepted as a threshold question whether “life, liberty or property” was directly affected by state action, but that required these concepts to be very broadly interpreted. Two Supreme Court cases involved teachers at state colleges whose contracts of employment had not been renewed as they expected, because of some political positions they had taken. Were they entitled to a hearing before they could be treated in this way? Previously, a state job was a “privilege” and the answer to this question was an emphatic “No!” Now, the Court decided that whether either of the two teachers had "property" would depend in each instance on whether persons in their position, under state law, held some form of tenure. One teacher had just been on a short term contract; because he served "at will" — without any state law claim or expectation to continuation — he had no “entitlement” once his contract expired. The other teacher worked under a longer-term arrangement that school officials seemed to have encouraged him to regard as a continuing one. This could create an “entitlement,” the Court said; the expectation need not be based on a statute, and an established custom of treating instructors who had taught for X years as having tenure could be shown. While, thus, some law-based relationship or expectation of continuation had to be shown before a federal court would say that process was "due," constitutional “property” was no longer just what the common law called “property”; it now included any legal relationship with the state that state law regarded as in some sense an “entitlement” of the citizen. Licenses, government jobs protected by civil service, or places on the welfare rolls were all defined by state laws as relations the citizen was entitled to keep until there was some reason to take them away, and therefore process was due before they could be taken away. This restated the formal “right/privilege” idea, but did so in a way that recognized the new dependency of citizens on relations with government, the “new property” as one scholar influentially called it. The application of this threshold test for whether process is due has presented three problems. The first is called the "positivist trap." Since whether one has an entitlement depends on the prescriptions of state law, legislatures may be able to define important relationships — ones on which citizens in fact come to depend — in ways that preclude the conclusion that an "entitlement" is present. Recent "welfare reform" legislation has been explicit that one its purposes is to end any idea that welfare is an "entitlement"; although largely directed to the question how long one may remain on welfare, the rhetoric seems also aimed at the “new property” idea. We are not discussing “liberty,” but you can see that similar problems will arise, perhaps even more importantly. What decisions affecting prisoners involve their “liberty” has been a particularly aggravating problem. The courts do not want to engage in close supervision of prison issues, but at the same time must recognize the plain command of the language of the clause. Moreover, if the provisions of a state law define not only an entitlement but also the procedures by which that relationship can be ended or altered, how can a court separate the two? Mustn't the citizen be prepared to accept the "bitter with the sweet"? This issue was presented when civil servants, enjoying tenure under statutes that provided for the procedures to be followed for removal, challenged the constitutionality of aspects of the removal procedures. The Court rejected the "bitter with the sweet" reasoning, but not without indicating a high level of respect for legislative judgments about what procedures would be fair. The second problem might be described as a problem about what is a "deprivation." A series of cases involving state harm to citizens led the Court to an almost inexplicable series of "due process" results. For example, an early case held that a state could not post a picture of a person naming him as an habitual drunkard without first providing a chance for a hearing; the posting made it unlawful for that person to be served alcoholic beverages in a bar. Yet when a city circulated the photograph of a person recently arrested (but not convicted) for petty theft under the heading "Active Shoplifters," causing enormous damage to his reputation, the failure first to provide a hearing was not objectionable. Another case established that school officials could not suspend a student for ten days without first giving him some kind of hearing; attendance at public school was an "entitlement." Yet a teacher who physically punished a student so severely that it kept him out of school for several days (but who did not formally exclude him from school) had not deprived her student of liberty or property without due process of law. Where liability was denied, perhaps one could say the challenged official acts did not change the victim's legal status. It was still lawful to shop, or to come to school if health permitted. Yet the harms seem if anything worse than in the cases where procedure was required. Some have thought it important that in these cases (and others), state law appeared to provide a remedy after the fact; the victim could sue the official for slander or for assault. To find "due process" violations in such matters would involve the federal courts in what had traditionally been the business of state law. As a dissenter in the corporal punishment case observed, these considerations appear to explain the results in a technical sense. Yet it seems fair to characterize the justice of the opposing results in these cases as deeply questionable. Finally, what about cases of potential entitlements for which a citizen is applying, and has not qualified? Does a statute saying that every citizen with characteristics A, B and C shall receive stated benefits or earn a driver's license create an "entitlement," so that "due process" constrains the application procedures the state can choose? Once qualified, the citizen could not be deprived of her "entitlement" without due process. Yet the Supreme Court has not said directly whether the same judgment applies at the application stage, and some Justices apparently believe that it does not. On the one hand, it can be said that the law is always more solicitous of established relationships than expectations. However, the "entitlement" analysis suffers some embarrassment in this argument. The claim of the citizen to state legality seems the same whether he has wrongly been denied access to an entitlement he has not yet enjoyed or has been terminated in one previously recognized. In its early decisions, like the rotten chicken case, the Supreme Court seemed repeatedly to indicate that, where only property rights were at stake (and particularly if there was some demonstrable urgency for public action) necessary hearings could be postponed to follow provisional, even irreversible, government action. This presumption changed in 1970 with the decision in Goldberg v. Kelly, a case arising out of a state-administered welfare program. New York was seeking to terminate the enrolment of Kelly and others in its welfare program. It conceded that a federal statute required it to provide a full hearing before a hearing officer before finally terminating their enrolment and even — anticipating the new property, “entitlement” approach — that the Due Process Clause required such a hearing. At issue in the case was only its effort to suspend payments pending that full and formal hearing, a question in effect of timing. For this limited purpose New York employed a more informal process. It was willing to give persons like Mrs. Kelly opportunities to confer with responsible social workers and to submit written views before suspension, but it gave no "hearing" in the judicial sense before the suspension was put into effect. The tremendous need facing a person dependent on welfare, even over a few weeks or months, persuaded the Goldberg Court that a suspension is in itself a deprivation, one that requires a hearing before it could be put into effect. Except for the situations mentioned earlier, where the courts have thought that a tort action could be an adequate remedy against officials who cause harm without affecting legal status, Goldberg in effect created a pre­sump­tion that hearings must come first. The "hearing first" aspect of its holding spread rapidly through a variety of civil judicial remedies — for example, limiting traditional summary procedures lenders had used to repossess cars bought on credit, when payments ceased. This aspect seems reasonably stable in today's law. It is interesting that these cases have never made what might seem an obvious comparison. In criminal law, the state often takes very damaging actions against people pending trial, with only limited procedural safeguards. Arrest and search require, at most, that police satisfy a judicial officer, a magistrate, that they have reasonable grounds to act; the person they are going to act against has no right to be present at the time. Detention pending trial requires no more than a showing of “probable cause,” and the person who is going to be detained has no right to present witnesses or ask questions of the persons who present evidence for the state. The result may be time in jail, disrupted families, terrible damage to reputation, the loss of a job. The inquiry New York made about Mrs. Kelley seems easily comparable to these criminal law inquiries, but that comparison was never made. Probably the hardest of the analytic questions arising under the procedural aspect of “due process” is this one, just what procedures are constitutionally due. This is a question that has to be answered for criminal trials (where the Bill of Rights provides many explicit answers), for civil trials (where the long history of English practice provides some landmarks), and for administrative proceedings, which did not appear on the legal landscape until a century or so after the Due Process Clause was first adopted. Because there are the fewest landmarks, the administrative cases present the hardest issues, and these are the ones we will discuss. As we have seen, the earliest expressions were very indefinite. The state had to provide “some kind of a hearing,” giving the citizen “the right to support his allegations by arguments however brief and, if need be, by proof however informal.” The battle over incorporation, however, made this seem a very subjective inquiry, and the reaction to the excesses of substantive due process made that subjectivity suspect. Judicially defining the liberties "indispensable to the dignity and happiness of a free man" case by case seemed a hazardous enterprise. At the same time, developments in the 1950's underscored the importance of fair administrative procedures. This was the time of McCarthy­ism and the red-baiting that went with it. Rumors generated by faceless informers were widely used to deprive government employees of their jobs because of doubts raised about their loyalty and security. The resulting inquiries often left the employees with their honor challenged but no realistic possibility of response. They emphasized the value, in an administrative context, of procedural protections long associated with Anglo-American criminal trials: the right to have the assistance of counsel; the right to know one's accuser and the evidence against one; the right to confront and cross-examine that person; the right to have decision based solely upon a record generated in open proceedings; as well as the right to present argument and evidence on one's own behalf. When the Goldberg Court came to answer the “what” question, it held that the state must provide a hearing before an impartial judicial officer, the right to an attorney's help, the right to present evidence and argument orally, the chance to examine all materials that would be relied on or to confront and cross-examine adverse witnesses, or a decision limited to the record thus made and explained in an opinion. The Court's basis for this elaborate holding has never been clear, although it seems to have some roots in the incorporation debates. Various prior cases were cited for the different ingredients provided for in the naval engineer's case (but not the cook's), for example, on the question of cross-examina­tion — but without attention to the possibility the requirements of due process would vary from setting to setting. The opinion was written as if all would agree that the procedures it was discussing were generally required whenever procedure was “due.” Yet, overall, the collection of procedures it required was atypically demanding even of final government administrative determinations on issues of great importance. A survey of forty federal programs made a few years after Goldberg, for example, found only one other program (also welfare-oriented) in which all the Goldberg rights were respected. For the substantial majority, fewer than half were provided; only notice, the assurance of some degree of impartiality, and an explanation of the basis of decision were observed with any degree of universality. Perhaps for this reason, an outpouring of cases after Goldberg's due process “explosion” quickly persuaded the Supreme Court to a more discriminating approach. Process was “due” to the student suspended for ten days, as to the doctor deprived of his license to practice medicine or the person accused of being a security risk; yet the difference in seriousness of the outcomes, of the charges, and of the institutions involved made it clear there could be no list of procedures that were always “due.” What the Constitution required would inevitably be dependent on the situation. What process is “due” is a question to which there cannot be a single answer. A successor case to Goldberg, Mathews v. Eldridge, tried instead to define a method by which due process questions could be successfully presented by lawyers and answered by courts. The approach it defined has remained the Court's preferred method for resolving questions over what process is due (although not one that the Court always refers to; sometimes it simply invokes tradition or some other basis for understanding). Mathews arose in a context much like Goldberg; Mr. Eldridge had been receiving disability benefits under a federally supported scheme. Responsible officials came to believe, on the basis of information he had provided and physicians' reports, that he was no longer disabled. They then notified him that they intended to terminate his benefits. Only written procedures were available before the termination was made provisionally effective. Eldridge was entitled to a full oral hearing at a later date, and would have received full benefits for the interim period if he prevailed. His argument, like Kelly's in Goldberg v. Kelly, was that even suspending payments to him pending the full hearing was a deprivation of a property interest that could not be effected without the use of the procedures specified in Goldberg. Using these factors, the Court first found the private interest here less significant than in Goldberg. A person who is arguably disabled but provisionally denied disability benefits, it said, is more likely to be able to find other "potential sources of temporary income" than a person who is arguably impoverished but provisionally denied welfare assistance. Respecting the second, it found the risk of error in using written procedures for the initial judgment to be low, and unlikely to be significantly reduced by adding oral or confrontational procedures of the Goldberg variety. It reasoned that disputes over eligibility for disability insurance typically concern one's medical condition, which could be decided, at least provisionally, on the basis of documentary submissions; it was impressed that Eldridge had full access to the agency's files, and the opportunity to submit in writing any further material he wished. Finally, the Court now attached more importance than the Goldberg Court had to the government's claims for efficiency. In particular, the Court assumed (as the Goldberg Court had not) that "resources available for any particular program of social welfare are not unlimited." Thus additional administrative costs for suspension hearings and payments while those hearings were awaiting resolution to persons ultimately found undeserving of benefits would subtract from the amounts available to pay benefits for those undoubtedly eligible to participate in the program. The Court also gave some weight to the "good-faith judgments" of the plan administrators what appropriate consideration of the claims of applicants would entail. Matthews v. Eldridge thus reorients the inquiry in a number of important respects. First, it emphasizes the variability of procedural requirements. Rather than create a standard list of procedures that, en gross, constitute the procedure that is "due," the opinion emphasizes that each setting or program invites its own assessment. About the only general statement that can be made is that persons holding interests protected by the due process clause are entitled to "some kind of hearing." Just what the elements of that hearing might be, however, depends on the concrete circumstances of the particular program at issue. Second, that assessment is to be made both concretely, and in a holistic manner. It is not a matter of approving this or that particular element of a procedural matrix in isolation, but of assessing the suitability of the ensemble in context. Third, and particularly important in its implications for litigation seeking procedural change, the assessment is to be made at the level of program operation, rather than in terms of the particular needs of the particular litigants involved in the matter before the Court. Cases that are pressed to appellate courts often are characterized by individual facts that make an unusually strong appeal for proceduralization. Indeed, one can often say that they are chosen for that appeal by the lawyers, when the lawsuit is supported by one of the many American organizations that seeks to use the courts to help establish their view of sound social policy. Justice William Brennan, the author of Goldberg, wrote about it afterwards in just these terms, and dissented from Mathews in a manner that again drew strongly on the plight of the particular individual threatened with loss of welfare in that case, as distinct from the general situation of disability benefit recipients and the general operation of the program, on which the majority had focused. The approach required by the Mathews majority seems more likely to preserve than to endanger existing procedural arrangements. Finally, and to similar effect, the second of the stated tests places on the party challenging the existing procedures the burden not only of demonstrating their insufficiency, but also of showing that some specific substitute or additional procedure will work a concrete improvement justifying its additional cost. Thus, it is inadequate merely to criticize. The litigant claiming procedural insufficiency must be prepared with a substitute program that can itself be justified. The Mathews approach is most successful when it is viewed as a set of instructions to attorneys involved in litigation concerning procedural issues. Attorneys now know how to make a persuasive showing on a procedural "due process" claim, and the probable effect of the approach is to discourage litigation drawing its motive force from the narrow (even if compelling) circumstances of a particular individual's position. The hard problem for the courts in the Mathews approach, which may be unavoidable, is suggested by the absence of fixed doctrine about the content of "due process" and by the very breadth of the inquiry required to establish its demands in a particular context. A judge has few reference points to begin with, and must decide on the basis of considerat­ions (such as the nature of a government program or the probable impact of a procedural requirement) that are very hard to develop in a trial. A not-at-all-surpris­ing result is to encourage judges to accept resolution of procedural issues by legislatures or others better placed to make these complex yet general assessments. Two examples may illustrate the problems judges face. The first arose when one of the federal circuit courts of appeal had to decide a dispute about the procedures to be followed in determining certain low-value claims under the national medical insurance scheme. Initially, the court ruled with confidence that access to some kind of oral procedure was required under some circumstances, for no reported case had ever approved a completely written procedure for a setting in which process was "due." Yet this reference point arose outside the Mathews decision as such; and when the case returned to the court at a later stage, it became clear that the Mathews inquiry did not answer for the court just how tightly access to an oral procedure could be controlled and just how informal that procedure could be. For example, would provision for discussions over the telephone suffice? The detailed outcome of the lawsuit seemed much more likely to be the product of negotiations between the litigants than to be the result of judicial decision. The second example involved a statute that, by very severely restricting the fees that could be paid, had the effect of denying veterans access to attorneys when they made claims under veterans benefits statutes. The Court was closely attentive to the Mathews formulation, and relied on statistics about the usual outcome of veterans' claims to establish that their need for attorneys' assistance was not high. Most veterans prevailed; veterans' organizations were available to provide substitute representation that seemed effective; and in the few cases in which lawyers had appeared, presumably without fee, veterans were not notably more successful than the general run. Yet these statistics cloaked what several of the Justices regarded as a real need for lawyers' assistance in a smaller group of much more complex cases. This was a focus the attorneys for the veterans groups had not developed. Some of the Justices thought that in a well-developed case the Mathews inquiry might demonstrate that attorneys help was constitutionally required in that sub-group of cases; others would have decided that, like the element of orality, access to an attorney was a necessary element of the process "due," one that could never be denied. What was apparent to both groups of Justices (together, a majority of the Court) was that the Mathews inquiry in this case was distorted by the great number of "easy cases," for which the desired procedural change would make little difference. Again, these are simply the kinds of procedures that might be claimed in a "due process" argument, roughly in order of their perceived importance, and not a list of procedures that will in fact be required. The United Federation of Teachers has long been perceived as a powerful union in New York City. So, why would so many of its members find themselves in need of legal representation when they find themselves unfairly targeted by an unethical principal when members pay so much in dues? This is the question many teachers are asking. So many of us are being harassed, abused and even brought up on false charges. In the age of “accountability,” the only accountable people seem to be teachers. Administrators do not need to account for anything, even abusing their employees. Teachers will call on their chapter leader and district reps only to be given false information. 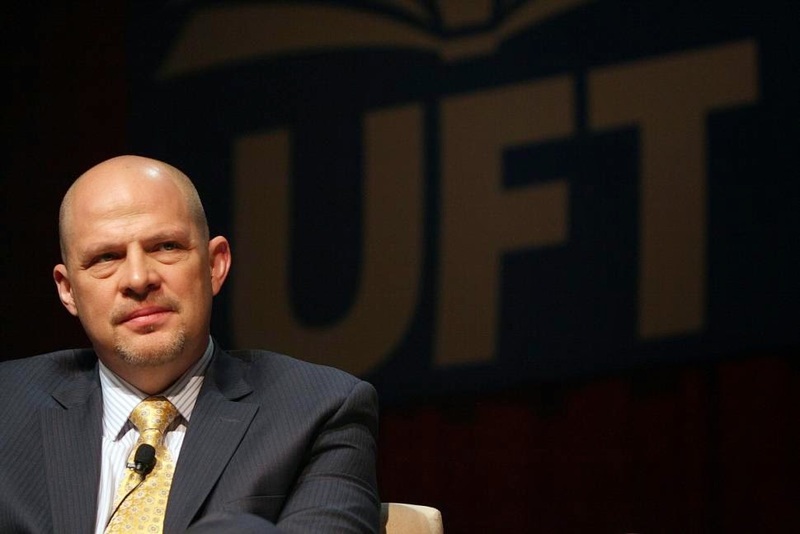 The UFT does NOT want members to know their rights. Why? When teachers find themselves unfairly targeted by their principal, even after an excellent career, there is very little they can do. Their only course of action is to get an attorney. Expensive veteran teachers are encouraged by their union representatives to retire. Whether they are financially able or not is irrelevant. Untenured teachers are told to just resign and move on to other careers. It doesn’t matter if the accusations against the teacher are founded or not. If the principal decides you are the target, you have no chance. If that principal wants to lie, manipulate, use other teachers against a particular teacher, there is nothing the UFT will do about it. That’s the little secret the UFT doesn’t want to get out: they are powerless and they don’t want members to know. My question is why pay union dues to a union that doesn’t support its members and only exists to pay fat salaries to union leaders who do absolutely nothing? New York City teachers deserve better. They deserve new union leadership — one that will advocate for its members.